Dun...Dundundun...Dundundun….Dundun...Dunnnnnnnnn. Sorry but it’s really hard to write out a guitar riff phonetically. The point here is that you’ll need to hold yourself back from singing “Eye of the Tiger” every time your little tyke makes an appearance in this adorable ensemble. You did you time looking through all the options and took your chances on this unique option and boy did it pay off...look how freaking adorable your kiddo looks in this Toddler Boxer Muscle Costume. He’s ready for a seriously cute training montage! And whether his fiercest opponent is a couch cushion or something more abstract, like bath time, he’ll be ready for ‘em! Just a kid and his will to survive. 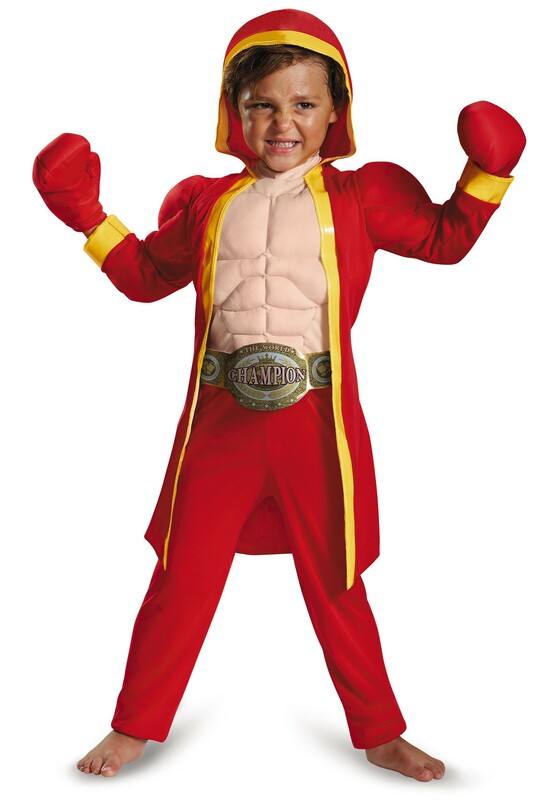 This costume is perfect for any toddler with a little extra energy to get out, a new boxing fan, or a tiny classic film buff! Without lifting weights (which isn’t recommended for young children) he can get the body of a pro boxer, just by slipping on this foam muscle chest and upper arms. Hey...we may just have to try that; it looks very realistic! The red hooded robe is attached, so you won’t have to keep track of where he takes it off and off (to practice his upper cuts and hooks, of course), and the stuffed boxing gloves...well...we’re surprised that they aren’t regulation for every toddler. They all want to punch and kick things, right? Isn’t it better your world be protected from his tiny blows? Warm up your singing pipes and get ready to announce his entrance into the living room...again, and again, and again!